Making a vinyl record is a rather complex manual and chemical process. Let’s look at some of the steps and terminology to make things easier. Lacquer (as in the stuff that you varnish a bowling alley with) dries, but does not cure as hard as urethane. We use a special formula for cutting that dries but does not harden for several months. The surface of these disks are soft enough to cut, but not so soft that they heal after being cut (the way fresh jello does). We cut the music onto a lacquer, a record-like disk. It has an aluminum base plate, and, attached to that base plate is about 20 millimeters of soft lacquer—think: very thin, dark-purple paint. It is dry to the touch, but can easily be indented by a fingernail. Lacquers cut as reference lacquers are sometimes referred to acetates. In either case, they can be played by normal turntables. Lacquers cut as masters should not be played. They are soft and even a careful needle drop will cause a very loud pop on every copy of the record. Electroplating involves using an electrically charged liquid to transfer metals from a solution onto the surface of a solid object—gold or silver plating as in jewelry, chrome plating as on classic car bumpers. The metal is built up on the surface the longer it is in the tank with the solution (or, bath). Lacquers are boxed and shipped ASAP to the plating plant. At the plating plant, the lacquers are cleaned with liquid and sprayed with a very thin coating of silver. They are then placed into one of two electroplating baths. The first bath is a low current bath. The silver layer and lacquer are relatively fragile, so they have to electroplate it slowly until a base layer has been established. Then the lacquer is taken to the next electroplating bath. This one is set to a much higher electric current (amps) and puts the metal on the disk much faster now that the metal layer has been built up from the previous step. Finally, when the desired thickness has been built up, the metal “part” is pulled away from the lacquer disk. This usually ruins the lacquer disk so only one metal part can be pulled off each lacquer. Then that part—a negative because it has ridges instead of grooves—is cleaned, trimmed, polished, and prepped for the next step. In the One Step Process, the part that is pulled from the lacquer is made into a stamper and can make a few hundred records before it either gets very noisy or breaks. This process is only for very short runs. Later, if you need to order more records, you will have to repeat the one step process from the beginning: cut a lacquer, plate it and make a new stamper. In a Three Step Process, the First Part that is pulled off the lacquer is put back into the plating bath and a new part is formed. In this process, the first part is called a Father. The new part pulled off the father is called the mother. A mother is an inverse of the inverse, so it is a positive disk with grooves just like a record. Often, in this step, the mother is played to listen for noises that might have been introduced in the plating process. It’s interesting to note that even the slighted invisible spec of dust that landed on the lacquer will cause a pop when its plated. You see, the size of the groove and the subtleties of the squiggles are all so small, that a microscopic imperfection is still large to the ear. The mother, after inspecting and cleaning, is plated once again to create a set of stampers. Several sets of stampers can be plated off each mother. Depending on the number of records being made, a new set of stampers is created for each 500 to 750 disks. There are several places in the process of plating where quality and care really show up in the final product. The best plating plants will do more inspections, catch more flaws, and ensure that the best and cleanest materials are being used. A whole lot can go wrong in the plating phase of record making. Make sure your mastering studio and your plating studio trust each other. It’s not unusual for one to blame the other for audible defects. Personally, I like to always have test pressings sent directly to me. I am used to listening to test pressings and can tell very quickly if we have a good or bad test. Finally—and I mean, eventually—your stampers are placed into a huge steam-heated molding called a Record Press. These overweight relics require careful monitoring by the operators. The process is automatic, but is not 100% perfect. 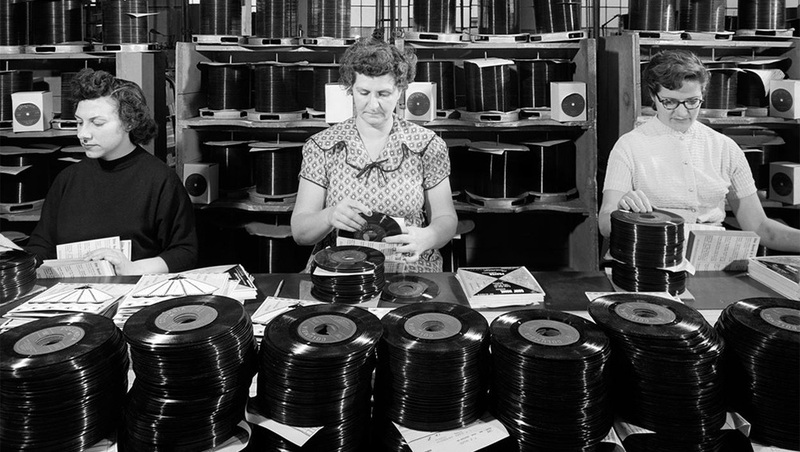 The results have to be inspected, cooled and packaged carefully or even more noise will be audible on the disk. I’m often surprised to find that most pressing plants do not listen to their discs. The process works well much of the time, but, when there are problems, you have to trust that the plant is doing everything it can. When your stampers are ready, the pressing plant will press off 5 -10 copies and send them to you. I strongly recommend you send a couple of these Test Pressings to your cutting studio to review. Your cutting engineer is the only person that knows how your record should sound. I mean, you know how your music should sound, but the cutting engineer knows how the recordshould sound. And, even more importantly, what the test pressings should sound like. Here’s the rest of the story: test pressings are not perfect. Even when everything else in the process is done perfectly, sometimes test pressings will exhibit flaws. You have to be able to tell the difference between serious defects in the process and ordinary flaws that are associated with the test pressings. Almost evey pressing plant utilizes a manual type press to make test pressings. They are often made in less than ideal conditions, and are always more noisy than the final records. There are several reasons for this: It’s a different press, the temperature might not be optimum and the quality of the vinyl may not be the same as they will use for your final run. So, with all these potential flaws, why are we paying for test pressings? You must listen to your metal work before pressing hundreds of pressings. If there is a serious flaw, it’s much better to catch it sooner than later. The main problem is, it takes so many steps to get from master to lacquer to father, mother and stamper and shipped back to you. Next time we’ll take a look at packaging, shipping and selling.